This is one of my favourite quotes from Star Wars, though it was never used in the movies. I don’t know how many times in my life I’ve been in the wrong place at the wrong time, or if one believes in fate, perhaps I was exactly where I was supposed to be. Each day is filled with choices, decisions, some huge, life-changing and others little, although who knows, they might be life changing as well. Today is May the 4th, some may know it as Intergalactic Star Wars Day. For some, that’s everyday. Nerds greet each other with, May the 4th Be With You. Posts, memes, parties, hash tags, sales, and news stories converge, in greater numbers. Although this May 4th, the news is more about Princess Charlotte Elizabeth Diana than Princess Leia. Tomorrow, to a lesser degree with Revenge of the Fifth, although I think Revenge of the Sixth makes more sense. Is that a thing? An old nemesis has descended upon me this May the 4th – my Darth Vader, my Boba Fett, Jabba the Hut (probably rather have Pizza the Hut), Rancor (although it smells better), Greedo, or Count Dooku – I’ve loosely titled it, Stars Wars VIII: Return of the Back Pain. Luckily it doesn’t hurt as much when I sit…and if I go over to The Dark Side, I hear they have cookies. I think I know what brought it on, an unusual activity (not nearly as exciting as it sounds). It also brings back horrible memories of the car accident where the pain originated and I’m left to watch my back, like the aptly titled book, Watch Your Back! by Richard A. Deyo MD (Cornell University Press). I read this last time my back pain flared, hoping for some answers. It left me with more questions as it’s straightforward information shone a light on The Dark Side of the medical profession which offers people less and less, for more and more. We don’t like to think that our pain is a business, but it’s big business. This book won’t be popular, it points out that the medical profession, like politics and other systems, to paraphrase George Lucas, is like a great tree, able to withstand any external force, but rots from within. The lure of money, power, and prestige can overcome common sense and decency. I understand the temptation of the magic fix, but realistically I know I have to do most of the figurative heavy lifting. As patients we should be pushing for more treatments that are sensible, empowering, and give effective, long-term results for moderate costs. I’m used to being in constant pain with Fibromyalgia, it waxes and wanes, but never actually ceases, but in a strange way pain can also be freeing. You see past the Jedi mind tricks or I guess more like Sith mind tricks…you see the truth. What about you, dear readers, do you ever see The Dark Side of people when they think they can’t get anything from you? Do you also see the power of The Force of goodness when some people like you just the way you are? The latter is what I choose to believe in. > I already went to the Dark Side… i work for the government. lol Yes, my dear, you have already gone to The Dark Side – do they at least give you cookies? I have an uncanny ability to see past what people say to what they really mean. I usually challenge them on that. People don’t like that. And yet on the whole, I am very positive. I think we should be best friends! Sorry you have the constant dark side of the illness, Donna. This surely is no fun, the constant presence of the fibro ache. I have fibromyalgia too. It used to be really bad but I started doing pilates and it helped a lot. Oh, that’s too bad. All exercise was really beneficial for me. When I first got it, it was post surgery and the doctors kept telling me to relax and not exercise and I think that was part of what was making me depressed and making my symptoms worse. When they gave me the green light to exercise you can only imagine how much better it was physically and mentally. I only saw the first Star Wars movie and have no idea why I didn’t continue with the rest. Ha ha ha. I mean the Sky Walker and Darth Vader very first movie in the series. I love movies but don’t get out to them much. I see lots of people lining up before me when I open the dark chocolate ginger biscuits, all hoping for a share. There are always more people than biscuits and I’m meant to be noble and give mine up. I ask, would you? I have RA and the chronic pain is a beast to deal with. I see my own dark side when I eat the wrong food, especially cookies. But sometimes the dark side is louder and I eat what I shouldn’t have, what can I say, I am human. Love Star wars, always have and always will! May the healing 4th be with you my dear! Hope you’re feeling better soon! 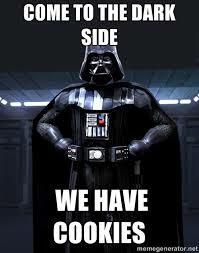 Stay away from the dark side do I… I buy my cookies at Mrs Field’s wait 3 dollars a cookie… That is the dark side! Didn’t you read my tips tonight? Do NOT go full Yoda! I didn’t, but I can’t help it…it’s not easy being green. LOOK AT ALL THE gifs! LIGHT SABERS WILL BE COOL AGAIN! Next you’ll be telling me that strangers in windowless vans have the best candy. Heal quickly. No, they definitely do not. What a great title. And I love the opening quote. Haven’t heard it before. Sometimes we fall into the adventure without meaning to, and gain a great deal from the journey. Hello Donna! I’m sorry about your back pain. I know what that’s like and it is no picnic. I’ve been in the medical field for many years and I’ve definitely seen the ‘Dark Side’ of some of the medical practitioners. I agree, medicine needs to return to the days when doctors investigated to find the origin of your pain instead of just treating the symptoms. I hope you get better soon. I think I did it all on my own… maybe… I am a computer moron… but I will see your posts in my reader, I believe. And every year, when the year ends and wordpress does that weird thing where they send you your stats, everybody I follow says I am the one who commented the most… so… that is why I try not to follow too many people. HA! Now tell me why you have such huge stats? What is the secret? Born in Canada or Canadian…I won’t hold it against you either way. Ahhhh, I see. Or not. See my tagline? I wish I was joking and secretly rich, but alas…my money all goes to my son, the little I have. I used to listen to Creedance Clearwater Revival play in their garage when I was walking home from elementary school. wait… how long have you been doing this? why do you have such good stats? I have funny words and pictures? what am I doing wrong? sigh………………. I don’t think I meant that about books, just the blog in general… but who knows… I don’t always listen to what I say. I see your post in my reader!!!!!!!!!!!!!!!!! As long as I don’t keep getting emails but I keep seeing new posts, I am happy. I may have to unfollow somebody to make time… and I will try to catch up with your old posts if I can… but I am excited… it is just the original commitment that scares me. I wish I could remember to check the Reader more….but it takes me sooooo long to scroll through. HA! I got an email telling me I am following you… in case I didn’t know… but I think I fixed that in my dashboard… unless I unfolowed you… aren’t you glad I’m here? This place is only missing one thing… a weird old guy with a head full of crack squirrels who is a computer moron… yay me!!! Are you testing if I can count? I liked Lenny and Squiggy. Sorry to hear about that pain… But you’ll get over it, I am sure.. Yes, relationships are too much about utility most times, excellent point.